Does your little one love running around the yard? No wait, he doesn't just like to run he wants to prove how fast he is. Is he always calling out, "Hey, watch this" as he tears around the grass? The hobby might seem like a bit of a handful sometimes but for now, you might just want to be grateful that it'll be a while before he's behind the wheel of his first car! 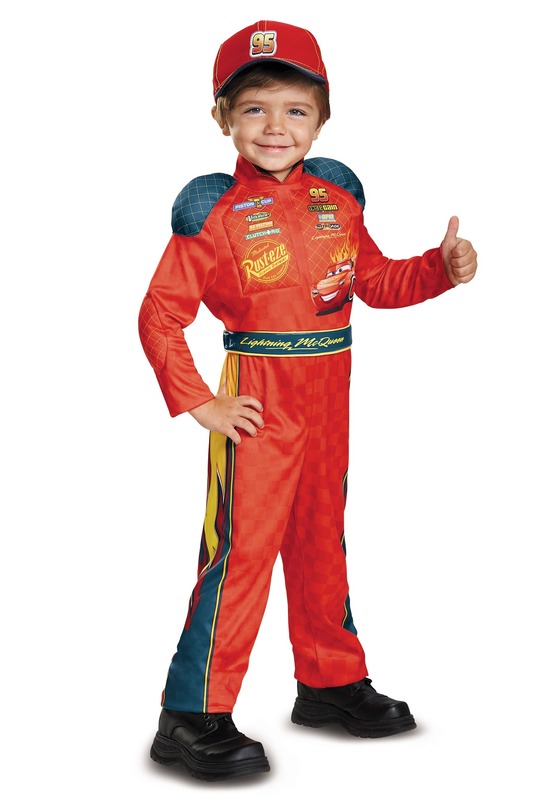 If your kiddo is a little speedster then he's probably a huge fan of Lightening McQueen. This is the red, confident star of the Cars series that can't seem to lose, he's got four piston belts stowed away in his truck, after all! McQueen is the character that your kid channels as he soars his toy car from the arm of the sofa over to the coffee table and down to the floor. From the very beginning, Lightning had two things on his mind: speed and glory. That is until he learned the power of friendship. Now he knows that no matter how fast he goes he'll always circle the track back to his friends. If you're looking for a costume that's great for Halloween and everyday play, you'll love this red and black jumpsuit. The subtly checked suit closes with a tough strip at the back. Your child can sprint around the yard with ease in the flexible material and with padded shoulders and sponsors on his chest he'll be faster than ever. Top it off with the red hat and he'll be ready to roll. Hey, who's gunning for a fifth piston belt? My son decided what he wants to be for halloween.. way too late but luckily the costume is available here and we received it on time. The fit was perfect! So yeah I'm a happy mommy. Smart and slim fit costume.